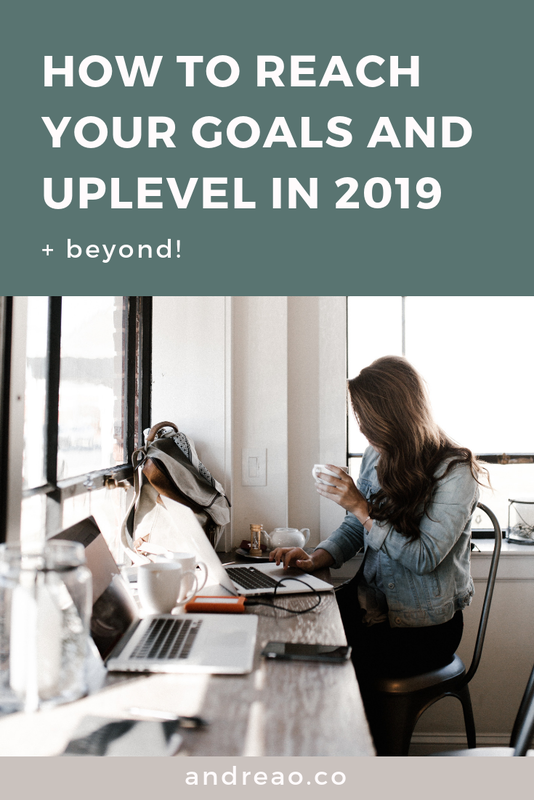 how to up level and Reach your goals in 2019 (+ beyond!) — Andrea O. So, here’s the thing about goal setting - but hear me out, because I have a kind of unpopular opinion. Goal setting is all well + good, but people spend a lot of time on MAKING goals instead of REACHING them, especially when it involves working on your business goals. And please know, I understand. I understand that making goals can be intimidating, that it’s easy to convince yourself that creating the perfect goal will mean that it gets done perfectly, that the idea of failing at something is enough to make us freeze + stop taking action altogether. I know that + I hear you - those are all the reasons that I get nervous about setting goals myself. But at the end of the day, I think we need to stop focusing so much on setting the perfect goal + start focusing on REACHING them. Even if your goal isn’t perfect. Even if you are a little nervous you might be going in the wrong direction. Making it a habit to reach your goals does something wonderful for you - not only have you reached a goal, you’ve shown yourself that you are a finisher. You get things done. So, no, I’m not here to tell you how to set goals - I’m in the business of reaching them. Is setting the right type of goal important? Yes, but for most of you, it’s secondary. If you’ve got a good idea of your business + your goal is related to moving it forward, then just commit + do it - because a lot of you are so close. The goals you’re making are focused enough to move you forward, but you’re wasting time and half committing because you’re not sure if your revenue goal should be $30,000 or $50,000. Because it’s easier to half-commit, fail + blame the plan than it is to really commit, dig deep + work in uncertainty. And that mindset is holding you back. You need to focus on your goal. Imagine you’re running a race - you’re on the track team and you’re in your little lane, ready to go. You don’t know if you’re the fastest, strongest, or best in the lineup - but you’re in your lane, ready to run, and the goal is the finish line. When the gun is shot + the race starts, you’re going. You’re getting to that finish line. There’s probably other stuff you need to do that day, but it’s race time, and when it’s race time, that’s all you worry about. Another thing that helps a lot is to know where you’re going. Know where you’re putting your feet. The big goal is the finish line, but where do you have to put your feet to get there? What actions can you take to actually achieve this goal? It’s easy to understand when you think about running a race - you run to the end of your lane, that’s where you go + the way is more or less clear. But when it comes to business goals, do you know where you’re going? Do you have milestones, or mini-goals, that signify the regular progress you make along the way? I talk to a lot of business owners about reaching their goals - and these two things always seem to be the game changers. They seem obvious, so we don’t pay attention to them & it slips between the cracks - but when you have goals you want to reach, you really can’t pay enough attention to them. When someone comes to me asking about a certain goal, I always start working on it by asking “are you consistently dedicating enough energy to that goal?” I ask this because when a goal starts to get difficult, or hard to achieve, it’s natural to want to spend less energy on it - and it might even start to slip from our schedule without us noticing. It’s normal, so don’t worry about it, but make sure to be deliberate about the high-quality energy that you’re spending on this goal. Then, I ask the second question, and this one’s a little harder. I ask “What small steps are you taking to reach your goal?” This is crucial, because if you don’t know the action steps to your goal, it doesn’t matter how much energy you dedicate to it - it’s just not going to work out. Small action steps are the key to moving from goal-setting to goal-reaching. I know that growing a business + reaching your goals can be intimidating, but this work is worth it. Reaching your goals is not only a great way to improve your life + biz in general, but it makes you feel more confident and capable when other challenges come up. This wasn’t something that came naturally to me - the early days of running my business left me feeling overwhelmed and incapable. I constantly felt like there was something wrong with me - and I’d really made a big leap to pursue this business over going back to school + starting a career in corporate Public Relations. I was terrified but optimistic, and even though it was slow going at first, I never quit on myself, instead, I committed to constantly improving + bringing my best self to the table. I decided that I was a finisher, and that my goals were non-negotiable. I’d love to say that this shift was all me, but while I did a lot of the work on my own, I have to credit my incredible brand designer + coach, Maria Wendt, for helping me make this shift. She was an incredible sounding board + gave me lots of direction as I worked to grow my business, and I’m so grateful for how much care she showed me + how much support she’s given me throughout this process. Talking to her made my goals seem a lot more doable, and it taught me to inspire this shift in myself and to how to bring this shift forward in other people. So, that being said, it’s okay if you’re not a natural at this yet. Almost no one is. Now, I teach people to succeed through reaching their goals - after making this major change in my mindset, I went from being a productivity coach to a Success + Energy Strategist, and I help entrepreneurs break their goals down, focus their energy, and create action plans that actually get things done. I work with + support entrepreneurs with big goals + dreams, but not enough time or energy to make them happen. I’m so grateful that I took the time to work on my own goal-reaching, because this is something that not only grew my business + life, but helped me show up for my clients in a bigger way to get them the results they really craved. I even have a package all about goal reaching - you meet with me, share about your goals + biz, I make a 90-Day Action Plan for you with 12 weekly milestones to meet, we meet again to set you on your way, and BOOM, you’ve got a roadmap to crush your goals. And on top of that, I also create a checklist of daily tasks that will move your business forward, so that every single day you’re moving towards your goal. So, here it is. My method to take overwhelmed entrepreneurs from goal-setting to goal-crushing. It’s pretty basic - you just need to set aside energy in your everyday life + break your goal down into action-steps. And when I share this method + work with people, I always promise them this: if you make a commitment to consistently reaching your goals, you will live a life you’ve never dreamed of. 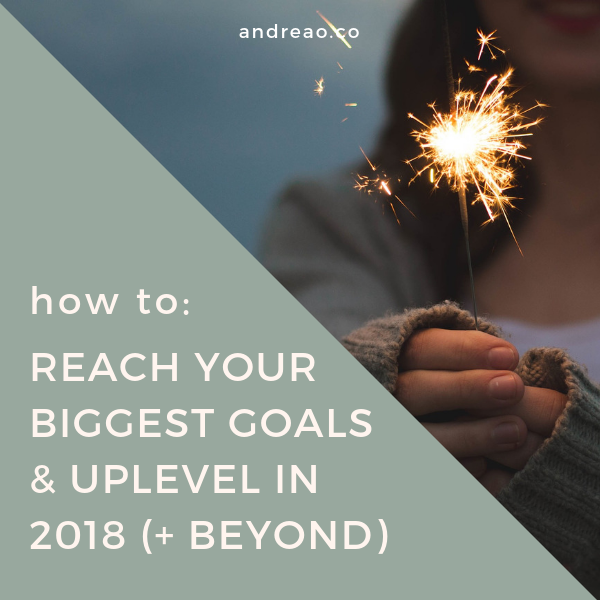 Because the thing is, not only are you reaching your goals + getting the goods from that, you’re also discovering how unlimited your potential is + how capable and confident you really are - and that’s the type of stuff that changes lives. If you’re ready to start crushing your goals, my advice to you is to get started. Today. My method is a great place to start if you’re a little overwhelmed by your goals and you want to keep it simple, but the thing is: it’s up to you to follow through + be the finisher that I know you can be. Trust me, if I can be a finisher, you can too. get your action plan + crush your goals! But, if you’d like a little extra support to crush those big goals + make things happen in your life, then I’m your girl. I break down goals in a way that gets them done + works with your life, and because I’ve streamlined my method + process so much, you’ll be well on your way with your 90-Day Action Plan in a few weeks. If you’d like to check it out, you can get more info here. I’m so proud of you for showing up + investing energy into your goals - it’s not easy work to do.